As we know that this is a major security issue to use root to log in Linux server directly because other staff behind you may see your password. Actually administrators should always use admin user to login the server instead of root. It’s time to consider creating a admin user. Since we already installed Webmin in previous article, let’s use Webmin to add an Admin user account. 1. Log in Webmin as root as shown in the diagram below. 2. Click the System icon from the top menu bar, the following window will appear. 3. 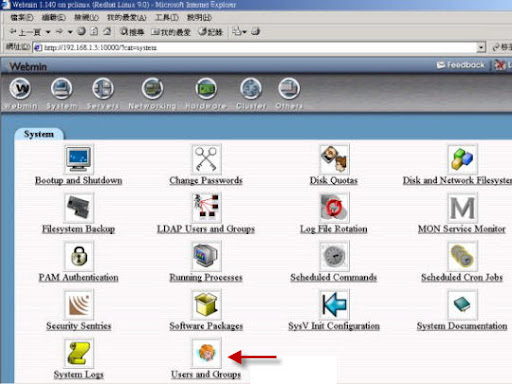 Click the User and Groups icon as shown in the diagram above, the following window will appear. It shows all users and group in the server as shown in the diagram below. 4. Add the admin user as shown in the diagram below. 5. A new user (admin) and a new group (admin) will be added to the server. Now it is much safer to log in the Linux server with the Admin account.